Obama’s number is 44. 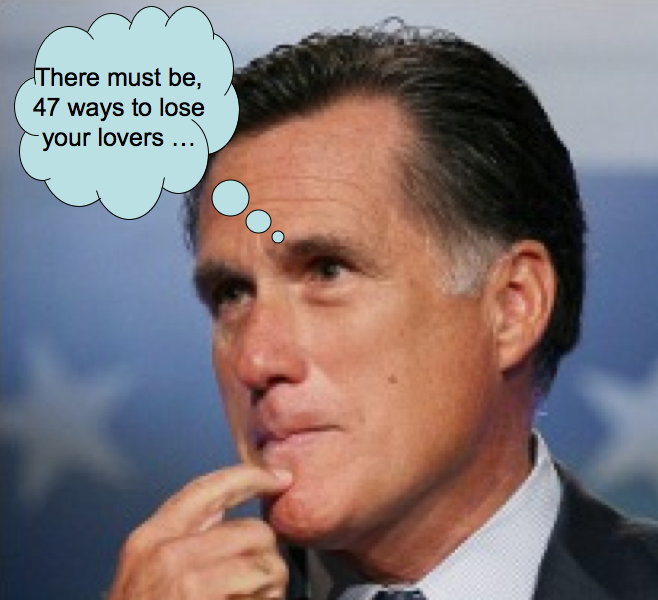 Romney will go down in history stuck with the number 47. One of the fundamental rules I talk about in my storytelling workshops is that “the power of storytelling rests in the specifics.” It’s one of those simple rules that you may have committed to memory, but you’ll still fall victim to it because it’s much easier to generalize than to nail the specifics on anything. So it bears repeating often. If you want to see an example of it in real life, just look at poor Mitt Romney. Let’s consider what would have happened, if on the leaked video Romney had said, “There are roughly half of the people who will vote for the President no matter what.” Would it now have much impact for people to show up at rallies with signs saying, “I’m one of the half.” Would that be very memorable? Would people even know what they’re talking about, or remember it a month later? If you wore a t-shirt saying, “Half” would most people make the connection? No, it would have stuck around for a week or so then faded into the noise of the campaign. But that’s not what he said. He said, “47 percent of the people.” And with that he took ownership of a specific number for probably the next few years. If you walked around town right now with a t-shirt saying, “47%” just about everybody would know exactly what you’re talking about. Half can have lots of other meanings, but 47? What else does that say to you right now? Nobody else owns it. It’s his. Unfortunately for Mitt, he was very, very specific. And now he’s learning the hard way about the power of specifics. You want to tell a strong story, you’ll want to talk about the 47 percent instead of the roughly half. He told a strong story. Now he’s stuck with it. And the greatest irony is that the biggest thing dogging him right now in his campaign rhetoric is the lack of specifics in what he has to say about budget cuts. So in two ways he’s learning about the power of specifics, and the weakness of their absence.